Happy Saint Patrick's Day! 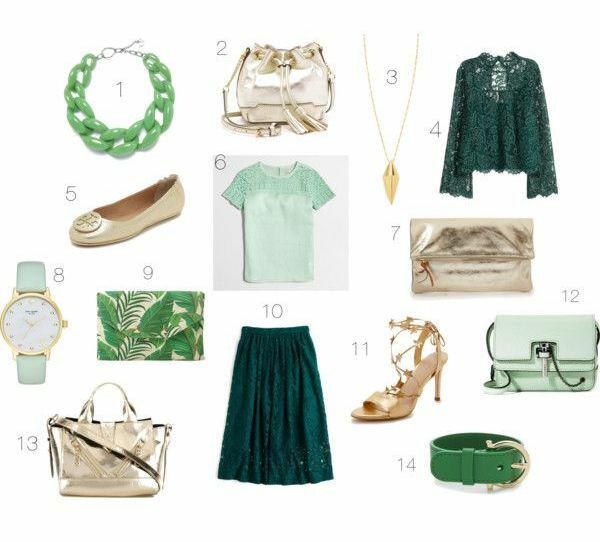 I know that the look below isn't exactly head to toe green, but it's a nice compromise for the holiday with a touch of green and a little gold to celebrate the holiday without looking too much like a leprechaun! I titled this post going green not only because of the Saint Patrick's day holiday, but also because the expression is a euphemism for recycling and for the most part, this outfit is almost completely recycled from a previous outfit that I posted almost a year ago. But truth be told, the original outfit, which can be found in my post entitled The Curse of Target, is one of my favorites, so why not repeat something that you love or that's brought you good luck in the past? 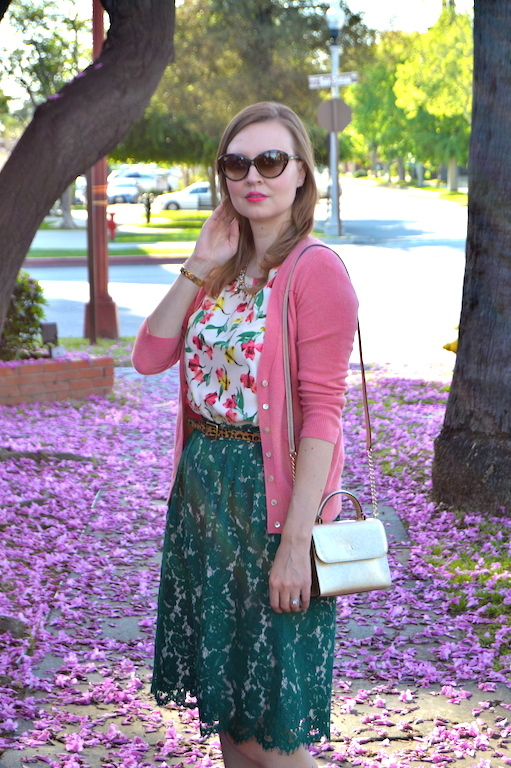 If you look at the previous post from last year, you will see that the blouse, necklace and green skirt are all the same, but this second time around the skirt is lace instead of cotton and my purse is gold, much like a lucky pot of gold at the end of a rainbow, or in this case a pile of pink blossoms! To go along with my theme of green and gold for Saint Patrick's Day, I am sharing some of my picks that fit into this color scheme. To be honest, this gold mini Nora bag from Kate Spade has become one of my favorite bags. In addition to the Nora bag, I have provided some other gold options below that are equally cute in different styles and shapes. I never thought that I would get so much use out of a gold bag, but what doesn't go with gold? Have a great Saint Patrick's day! I love the floral paired with the green lace. Beautiful! I love your floral top and lace skirt. What a beautiful place to take photos! Love the mix of colors and prints. That bag is pretty fab too! You mixed the prints so well! Happy St. Patrick's Day! this combo looks great, and is even more enhanced with the pink cardi. love the purse, too. i would so not be able to pull this together, lol. The florals are all so pretty! Love how you mixed prints! What a fun combination of colors and patterns! It all works so well together. I can't believe all those flowers on the ground around you!! We'd love to see you on Tuesdays for our Tuesday Fashion Party Link Up! 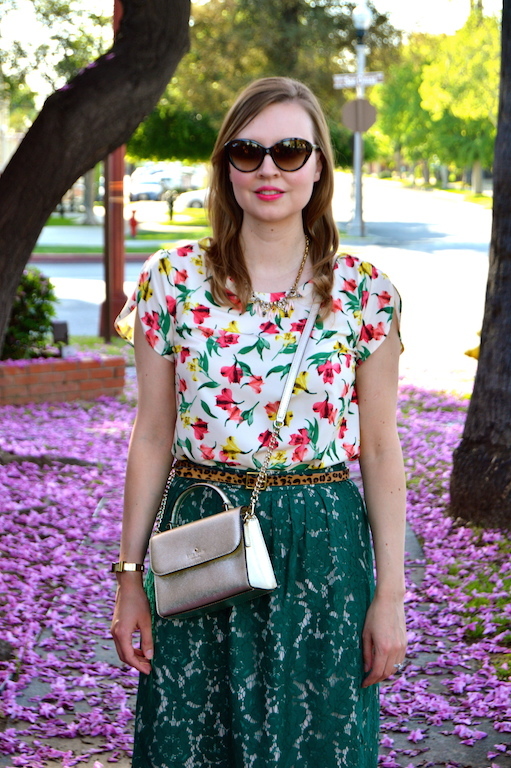 Perfect spring look. I actually wore an almost identical outfit today IRL (same skirt with floral top and gold too). Thank you for joining TBT Fashion link up and hope to see you next week. Have a great weekend! 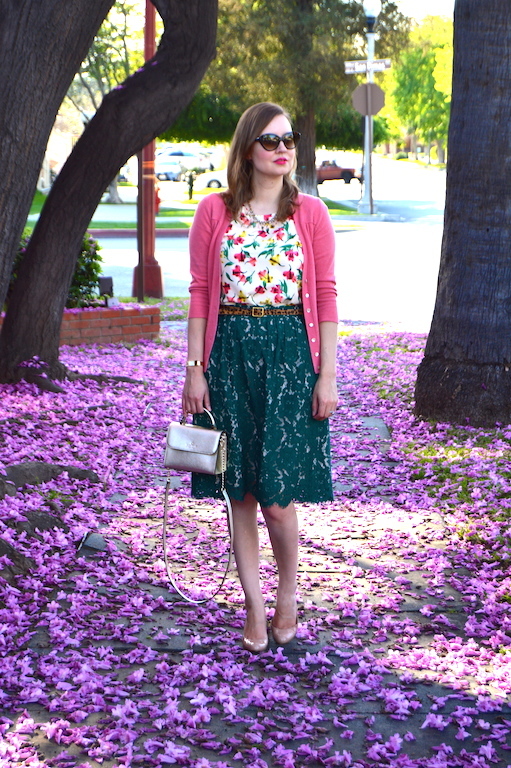 I love the floral and lace mix, they go together so nicely! You did better than I did with the green--I barely wore any green. I just don't have a lot of green in my closet. I need to change that though! The cutest! I could pick you as a fav every week, Katie! Love the pretty blossoms all over too.